Ask fellow campers about "Driftwood Campgrounds" and nearby attractions. very quiet and clean. host lives on site. he was very helpful. the pool was not open but looked nice. nice playground. spacious, concrete, level sites. No cable but can get a good bit with an antenna. wifi was better outside the camper. We camped at Driftwood Campgrounds in a Fifth Wheel. Very clean, concrete pads and patios at site, very level. Owner very friendly and helpful. Lots of big open spaces for kids to run or walking dogs. Quiet... heard a train far away a couple of times but didn't bother me. Huge park across the street. Seasonal (or full-time) campers sites were clean and organized, not an eyesore like a lot of places. Definitely staying here again. Wifi extremely slow but owner acknowledged this at registration. We camped at Driftwood Campgrounds in a Motorhome. This out of the way campground is well used and busy. The sites are easy to get in and out of but they are close to each other. All back-ins. Some permanent residents. No noise. Lots of lights. Trash and office not convenient to campers - you have to hike up a good steep hill. Staff friendly and helpful as were our neighbors. Was told that the wifi was weak and at our site would be non existent. He was right. Not a convenient overnighter for travelers but is a good campground for activities in the area. It's an old campground and the site we had was broken concrete strips that we were supposed to stay on. We camped at Driftwood Campgrounds in a Fifth Wheel. I expected this campground to be very small but I was pleasantly surprised. The interior road is double wide gravel making for very easy back ins. They also have a couple of double long (perhaps 150') pull thrus which can be used as a single pull thru or the first RV pulls thru and the second backs in behind them. That gives the park a lot of flexibility when they aren't full. Most sites have a nice level concrete pad & are long enough for any rig. Very pleasant camp host showed us to our site. Road noise can be distracting in the early evening and morning. The rest of the time it's pretty quiet. About half the sites would be good for satellite. There's no cable TV but I picked up all major networks on digital antenna. Verizon had a weak but functional 2 bar LTE signal. Park wifi worked well on my external antenna but was very weak without it. Other than a swimming pool & picnic tables on concrete patios, I didn't see any amenities. Water pressure is 100 psi so plan accordingly. I second what others have said about GPS routing. My GPS thought this campground was in the middle of downtown Quincy. Avoid Cedar Street however you get here. I got a 10% Good Sam discount but apparently you only get that if you pay cash. We camped at Driftwood Campgrounds in a Fifth Wheel. You'll come down a very steep 2 blocks as you approach Bonansinga Drive & of course there are stop signs at the bottom so take it very slow. Kochs Lane to the north and Vermont or New Hampshire streets to the south are safe to descend down to Bonansinga. Interior roads were packed gravel and in good condition. Sites had level concrete pads with very good spacing and utilities placed at the rear. Sites had a beautiful concrete patio with new picnic table. Owners are very helpful and take you to your site. No recycling. Noise is non-existent. WiFi coverage could be weak but owner gave us a site that was in direct sight of the router so we got by OK. We had 2/5 bars on Verizon Cell. The CG is very close to city parks and the Mississippi River. This was an overnight stay for us. We camped at Driftwood Campgrounds in a Fifth Wheel. Be careful of GPS directions. Our Garmin led us to the wrong place using the campground name and, using the address had the right location, but routing was bad with overhanging trees and poor pavement. Owner said Google maps routing is also bad, bringing RVs to a low underpass near the bottom of a hill. I recommend from US24, W on Kochs Lane, S on Boninsinga. Owners were wonderful very personable. They knew our names when we pulled in the park. Very accommodating. Loved our stay. Would stay there again. We camped at Driftwood Campgrounds in a Travel Trailer. We went to Quincy to buy a 1964 Corvair for my girl. We pulled the car trailer with the coach and this is the only RV park in the area. Weather was horrible or we would have stayed longer. Nice little park with a gracious owner. It was a little noisy in the morning with the road traffic but it didn't ruin our stay. Well maintained park and the owner Denise works hard at keeping it that way. We will be back. We camped at Driftwood Campgrounds in a Motorhome. This is a nice park. The owner was very friendly. They had a huge windstorm that had come through and were still in the cleanup process. Lots of huge trees with broken limbs. The park was nice but we were parked next to the road and although it did not appear to be on a busy road, it was, and there was quite a bit of traffic in the morning which made it noisy. We were hoping the pool would be open, but it must've closed Labor Day. It was pretty warm and would've been nice to use. There was no shade at our site, but others did have plenty. We were only here one night. Would stop again for an overnight. We camped at Driftwood Campgrounds in a Fifth Wheel. There was a city park across the street that you could walk to and enjoy views of the Mississippi River, but it was closed due to all the downed trees. Would've like to have gotten into it. It looked nice. This campground is named Driftwood, but Google maps lists it by its former name, River Valley. Our site was a long, level cement pad with easy utility connections, good wifi, and very good Verizon signal. Large grassy areas studded with mature trees, and we got a good satellite shot. We camped at Driftwood Campgrounds in a Motorhome. Called ahead and was assigned site 37, a spacious level back-in concrete pad, large enough for both our 35' motorhome and toad, nice picnic table, no cable but a good number of over-the-air channels. WiFi did not reach our site. Water still on in spite of freezing temperatures. No fenced dog park but generous areas to walk dogs. Fair distance from site to washrooms. We read cautions regarding avoidance of narrow underpass for accessing the park but even the other route took us under some low hanging tree branches. Manager was very accomodating. We used this park as a home base to drive the toad to Hannibal and view the Mark Twain sites. Rate was with Good Sam discount. We camped at Driftwood Campgrounds in a . Call the campground to get directions before arriving, there are some roads with low clearance bridges where your GPS may tell you to go, but the wonderful host will steer you right. 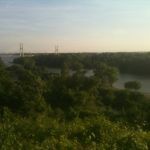 From the town of Quincy (and its one way steets) its down the hill and along the Mississippi River which you can view from a county park on the other side of the road from the campground. Lovely campground built on the hillside, trees, pool and playground equipment for the kids, outside picnic tables. Good over the air reception on about 4-6 channels. Wifi from office area only but is good from there. Verizon gets a roaming signal. Host is very accommodating to your needs. Enjoyed the stay. We camped at Driftwood Campgrounds in a Motorhome. When we came here we were expecting to stay maybe a week but ended up staying a month. The manager was super nice and did everything possible to make our stay pleasant. Dog friendly which we appreciated since we have 2 dogs. The park was quiet and within walking distance to the Mississippi and a nice city park across the street. We would definitely stay here again. As mentioned before, Verizon does not work well in Quincy but the Wi-Fi here was fine. Highly recommend this place. We camped at Driftwood Campgrounds in a Travel Trailer. Phone number listed is the office using (217) 430-3575 will give your better luck contacting the manager. The park is conveniently located in a semi rural area adjacent to the Mississippi River, but close enough for shopping / entertainment. Park is very neat and well maintained. Manager is super helpful and seems to work tirelessly in maintaining an excellent park. Rate reflects full hook up and spotless showers/restroom, Wi-Fi is fast if you have a direct line of site but does sometimes slow with numerous users. Will definitely stay here again We camped at Driftwood Campgrounds in a Motorhome. Friendly and accommodating staff, big rig friendly, long and level cement pad with good power and water pressure. We would stay here again! Some notes: the water pressure here is about 110 PSI, so bring your water pressure regulator. Because of where this park is situated, there is NO over-the-air TV signal nor is there cable TV. Our Verizon air card did not work because Verizon is not in this area, but we had 1-2 bars on our cell phones. The park's free Wi-Fi worked just fine for us, though. I would recommend that you call ahead for RV friendly directions if you are arriving from the south on US Hwy 61! We enjoyed our stay here. We camped at Driftwood Campgrounds in a Motorhome. Are you affiliated with Driftwood Campgrounds ?